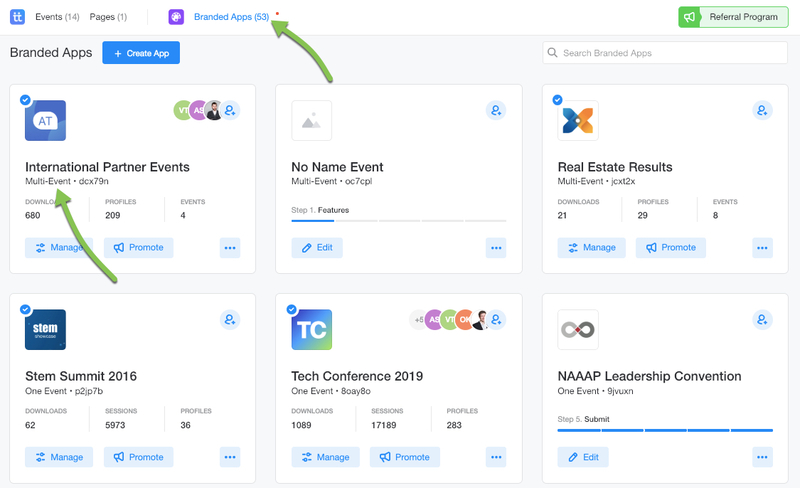 Once your multi-event app has been published, there are important things to know about managing and updating the app going forward. This guide will cover those elements - such as creating a new event, managing existing ones, and how to manage attendee access to each event. Directly under each app's name will designate whether it is a One Event or Multi-Event app. Once you've located your multi-event app, click the "Manage" button. At the app level, you have a separate set of menu options than at the event level. 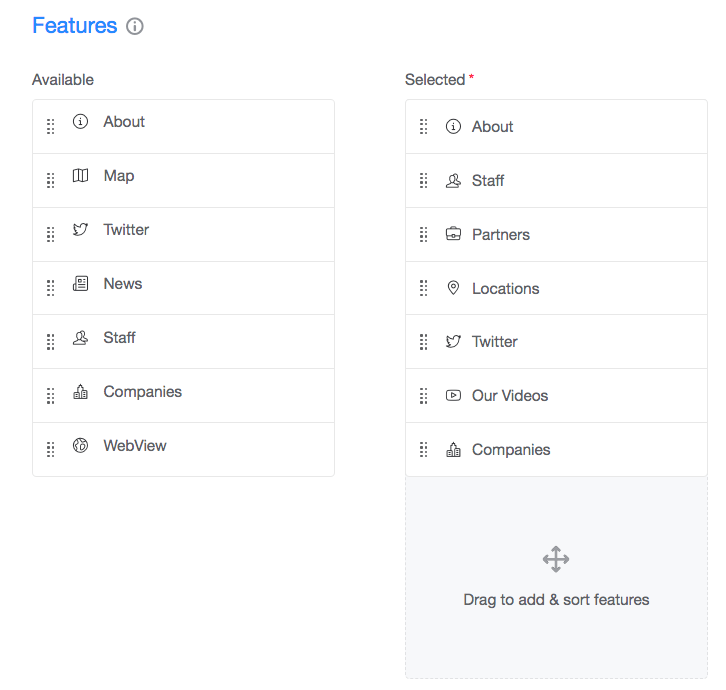 These options allow you to customize the app's appearance, content, attendee access and settings available for the app. At the bottom of this page you can customize the menu at the app level for your attendees. These menu items can be renamed and adapted to fit your needs, and you can modify the menu and content at any time. Your app menu should be short & simple - it will be accessed before attendees "Join" each event and should include overall information relevant to all events, such as "Contacts" or "About Us". The next tab, Content, allows you to add/edit what details show up for each of the features you've added to your app menu. We have more on how to edit these individual elements in our How to Build a Multi-Event App guide. The Notifications tab allows you to view all previously sent push notifications, and set new ones to be sent out. These can be sent right away or scheduled in advance, and can be sent to all profiles on your app, or just those attendees of specific events within it. We have more on using this feature in our Push Notifications guide. The People tab allows you to manage all of the profiles added to your app. This is where you can manually add or remove specific members to or from events, assign them to Groups, and trigger password resets. Upload your attendee list to your multi-event app to pre-populate profile details or manage access to the app. It's important to note that the metrics available at the container-level Analytics tab differ slightly from what's available at the event-level analytics dashboard. The event-level Analytics allow you to view more granular data specific to that event, such as social feature engagement, leaderboard progress, and session feedback. We have more on how to view the event-level reporting here. 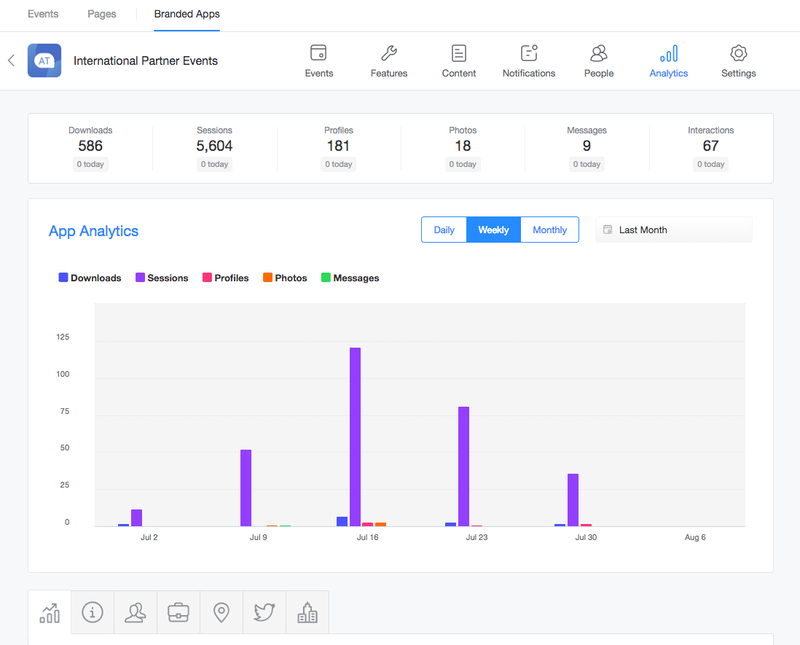 If you want to export archives of your social activity and app analytics, you would need to do this at the event level analytics dashboard, following the steps here. Finally, the Settings tab allows you to manage various security, social, and integration preferences at both the container level and the event level, but there are slight differences between their functions. Access Management controls how users will access your general container app, and join your individual events within it. You can update access management settings at any point after publishing your multi-event app. You can do so easily both at the App (container) and Event levels. By default all events within the multi-event app are publicly visible, however you can limit access to each event or even make an event invisible. We have a deep dive on how these security settings work, and how they differ from container level to event level here. 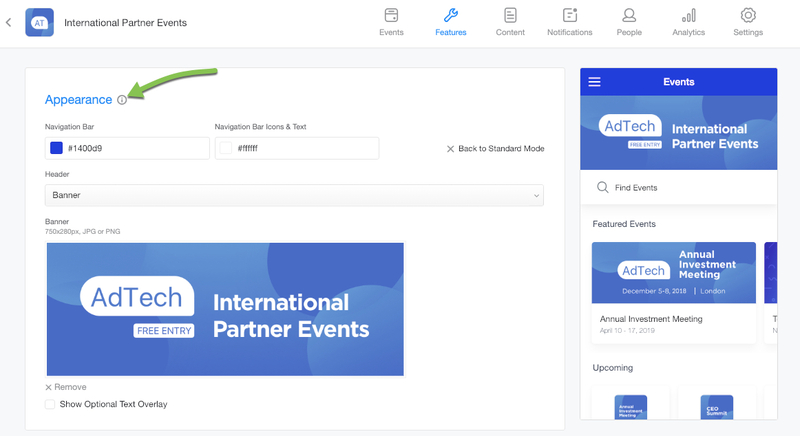 The Featured Events tab (container level) and Featured Content tab (event level) allow you to promote your most relevant event/content at the top of the Events page and event cards, making them easily accessible. For more on this, see our guide on how to Pin Featured Events and Content to the top of your Multi-Event app. The Web App settings allow you to control how your attendees can access your event from a browser. We have an overview of the Web App functionality here. 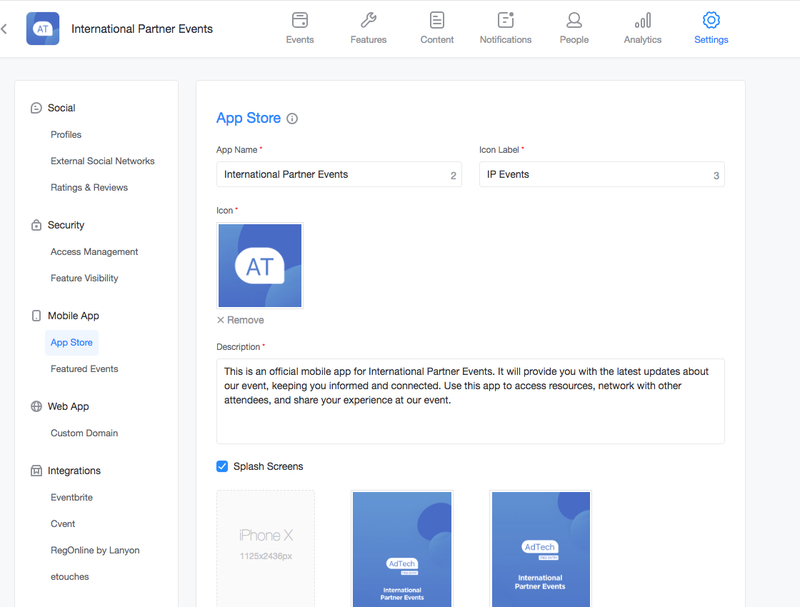 Finally, the Integrations section allows you to connect your Attendify app with other event planning services, to maximize your time and productivity. 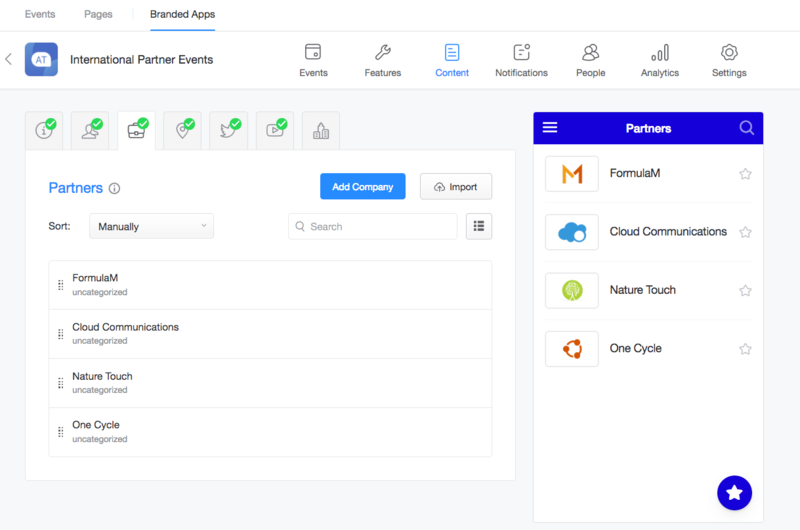 See our guide on how to manage Multi-Event App Integrations. For more extensive tutorials on how to manage your event app settings please see our help section here. 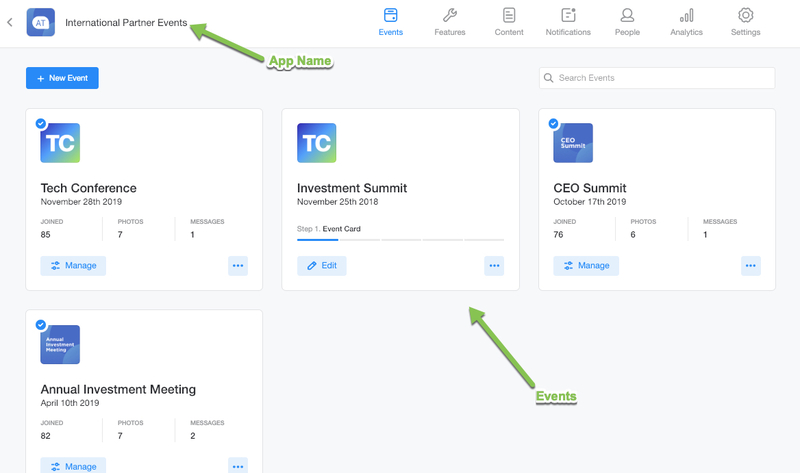 Our Multi-Event app offers a simpler, more streamlined approach to event management that will make it easy for you to drive user engagement year-round.